Kenya has done it again; the country has scooped the World’s Leading Safari Destination at the 20th World Travel Awards (WTA) grand finale in Doha, Qatar. Kenya got the most votes from travel agents worldwide at the auspicious ceremony event held on 30th November 2013 to beat other competing destinations. The award comes barely a month after the country’s tourism marketing agency Kenya Tourism Board (KTB) was voted Africa’s leading Tourism Board in Africa by WTA during the Africa chapter held in Kenya in October. KTB Managing Director Muriithi Ndegwa termed the award an endorsement of Kenya as a home to authentic safari. “Kenya’s pride has been reaffirmed by this award which comes after KTB was also voted Africa’s leading Tourism Board in October this year,” said Ndegwa. “While we have been in contention for this and other awards, this is by far the greatest achievement we have received. We are alive to the fact that we must sustain our lead, through additional investments in the sector to ensure that the Kenyan experience for tourists remains unmatched.” said Mr. Ndegwa. Kenya is the original quintessential safari destination. Famous for its sweeping plains, abundant wildlife and unique cultures, a Kenya safari is guaranteed to leave a lasting impression. Kenya also has an exceptional tropical coastline of warm waters, coral reefs and powdery palm-fringed beaches – the perfect curtain call to a Kenya safari. Unique attractions such as the annual wildebeest migration are one of the most memorable Kenya safari experiences that have continued to put Kenya on the map as a safari destination. 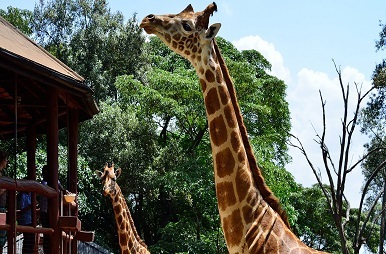 Kenya dominated at the 20th World Travel Awards gala dinner ceremony hosted by Kenya Tourism Board at Safari Park Hotel with more than ten awards scooped by various Kenyan- based tourism industry players. Kenya Tourism Board (KTB) led the pack by retaining Africa’s leading tourism board for the second time in a row. Kenya Airways won the Africa’s Leading Airline –Business Class with Maasai Mara national reserve named Africa’s Leading national park Brand. The host venue Safari park Hotels & Casino won the coveted title of Africa’s leading Meetings, Incentives, Conferences and Exhibitions (MICE) Hotel. Speaking during the event the Cabinet Secretary for East African Affairs, Commerce and Tourism, Phyllis Kandie, urged tourism stakeholders across the continent to work together in growing the tourism sector in Africa. “Africa is our next frontier and this is the time for us as a continent to leverage on each other’s strength, synergize on our varied expertise so as to grow our tourism sector to greater heights”, she said. Kandie added that besides the traditional tourist source markets such as the US, UK, Germany, France and Italy, Kenya has now identified Africa as the next frontier with the potential of helping boost tourism arrivals and the government has in response mounted marketing campaigns within the continent. Others winners in their respective categories in Africa were; Africa’s leading Eco-Hotel won by Amboseli Serena Safari Lodge, Africa’s leading Eco-Lodge went to Il Ngwesi lodge, Africa’s Leading green hotel went to the Aberdare Country Club, Africa’s Leading new hotel won by Villa Rosa Kempinski Nairobi, while the Africa’s Leading resort award went to Alfajiri Villas. Others included Finch Hatton, Twiga Tours, Leopard Beach and Resort Spa, Game Watchers Safaris and Porini Camps. tourism board and attributed the success to the effort to being the absolute best in all aspects of marketing the country’s offerings. “We are honoured to win the title of the Leading Tourism Board for the second time which supports our extensive recovery and stabilization from the recent unfortunate incidents in our country. Our marketing initiatives have brought the success and we are keen to further improve our international profile as well as reach out to new markets”, he added. The World Travel Awards was established in 1993 to recognize and reward outstanding achievements within the global travel industry and the awards are endorsed by celebrities, travel trade and press from around the world. The awards have been hailed by The Wall Street Journal as the ‘Oscars’ of the travel industry’, and winners are nominated by over 40 000 travel trade professionals world-wide.